In the 1800s astronomers realized that the appearance of sunspots was cyclic, with a period averaging about 11 years. As new features of the Sun (solar flares, filaments, prominences, coronal loops and coronal mass ejections) were discovered, it was found that they too varied along with the frequency of sunspots. The sunspot number is now commonly accepted as a measure of solar activity. Solar activity itself has been linked to satellite failures, electrical power outages, and variations in Earths climate. The impact of solar activity on Earth and our technology has created a need for a better understanding of, and the ability to predict, solar activity. Sunspot activity over the last four hundred years has shown that the amplitude of the sunspot cycle varies from one cycle to the next. The average cycle has a peak sunspot number of about 150. At times, as in the period known as the Maunder Minimum between 1645 and 1715, solar activity can become so weak that it seems to disappear for several decades at a time. Sunspot Cycles. The amplitude of the sunspot cycles from 1600 to present varies substantially. This includes the MaunderMinimum, a period from 1645 to 1700 when the magnetic fields were too weak to produce sunspots. 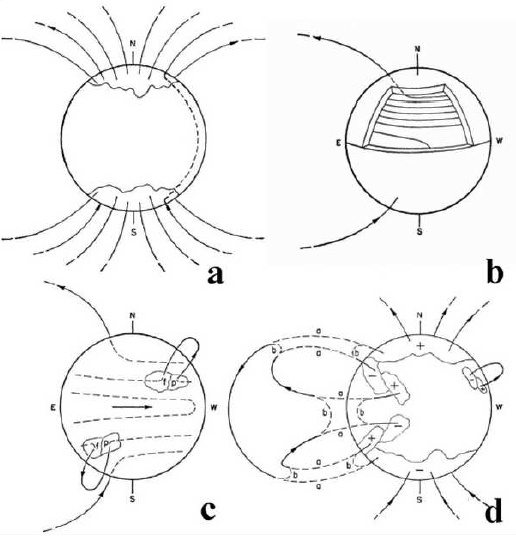 The Magnetic Butterfly Diagram illustrates how the distribution of magnetic flux changes over time. Sunspots appear in bands on either side of the equator. Cycles typically overlap by 2-3 years. At the beginning of each cycle, the active regions emerge at latitudes of about 30 degrees. As the cycle progresses, the active regions emerge closer and closer to the equator, an effect known as Sporer’s Law. Cancellation of polarity across the equator leaves behind an excess of following polarity that is transported to the poles. The north and south poles have opposite polarities that reverse from cycle to cycle. The timing of this polar field reversal is near the time of the solar cycle maximum. Solar Minimum. An axisymmetric dipole (poloidal) field exists. Field lines emerge at high latitudes and thread through the convection zone to the opposite hemisphere. Differential Rotation causes the submerged magnetic field to stretch in the toroidal direction (wrapping around the Sun). The field is strengthened by this stretching. The toroidal field become buoyant and causes sunspots to emerge with Joy’s Tilt and Hale’s Polarity (polarity of leading spots matches the polarity of the polar field at minimum). Magnetic flux is shredded off of the sunspots. The leading polarity fields cancel across the equator. The surface flows transport the following polarity to the poles. The following polarity cancels the old polar field and creates a new poloidal field with opposite polarity. While Babcock’s model is widely accepted as the underlying mechanism behind the solar cycle, the finer details are still not well understood. Given this (and many more recent dynamo models), most solar physicists agree that the polar fields at solar minimum are the seeds to the next solar cycle.